Chinnamasta Devi Jayanti is believed to be the day when Goddess Shakti appeared in the Goddess Chinnamasta form. Chinnmasta Jayanti 2019 date is May 17. It is observed on the Chaturdashi (14th day) during the Shukla Paksha of Vaishakha month by some Hindu communities. Chinnamasta is the sixth Goddess in the Dasamaha Vidya or the ten mother goddesses. She is an incarnation of Goddess Shakti. 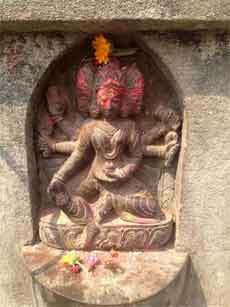 A popular image of Goddess Chinnmasta is that of her offering her own head as food to one of her devotees. Legend has it that once Goddess Parvati went to take bath and her attendants, Jaya and Vijaya, were asked to guard her. Goddess Parvati was so much engrossed in her bath that she lost count of time. After sometime Jaya and Vijaya kept demanding for food and the merciful Goddess offered herself as food. Chinnamasta is associated with the Veena and the Navagraha Rahu. Please note that the day is also observed as Narasimha Jayanti by Vishnu devotees.